What do you do if Alcatraz Tickets are sold out during your trip to San Francisco? Read our guide below to find out how to score last minute Alcatraz tickets. While there are many Alcatraz Bay Tours that will take you around Alcatraz, there is only one company allowed to take travelers onto Alcatraz Island and which sells official Alcatraz tickets. Meet Alcatraz Cruises — the official Alcatraz ferry to the infamous former San Francisco prison, and one of the only places you’ll find Alcatraz tour times and official tickets (including Alcatraz night tour tickets). If you’re wondering where to buy Alcatraz tickets, this is usually the first place that you come across on Google to purchase tickets. So, how much are Alcatraz tickets? The Alcatraz tickets price starts around $38 for Adults and $23.50 for children if you buy from the official Alcatraz site. The first question a lot of people have about tickets to Alcatraz is how on Earth a National Park can be so expensive?? What exactly is included in these Alcatraz reservations to justify the cost? Here’s the thing. Your ticket to Alcatraz isn’t for entry on to the island. Part of the ticket cost includes the amazing audio tour of the cell house, but most of the ticket cost goes to the for-profit Alcatraz Cruises to pay for your ferry ride to/from the island (the one and only way of how to get to Alcatraz). 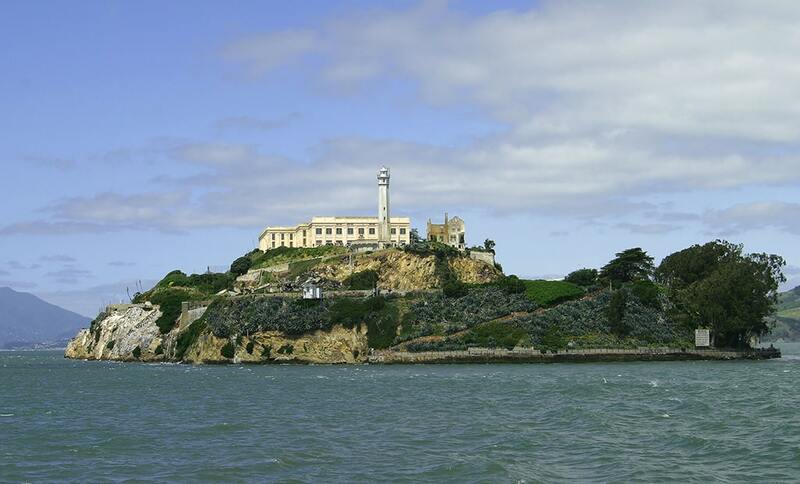 Did you know that Alcatraz Island is the most popular National Park to visit? This means that Alcatraz ferry tickets sell out fast! If you’re planning on visiting Alcatraz Island anywhere from March through October then chances are you’ll find that Alcatraz Island tickets are sold out. Here’s how to get Alcatraz tickets if they’re sold out on the official site. Once upon a time people used to be trying to Escape from Alcatraz, now, they’re dying to get onto the island and there aren’t enough Alcatraz tickets for sale. Even Justin Timberlake was turned away from the island when he showed up on the San Francisco Fire Department’s fire boat! Turning to Craigslist or StubHub might work for sold out tickets, until you realize that it is illegal to re-sell tickets to Alcatraz (i.e. these sites aren’t the best place to legally find Alcatraz tickets last minute). These sites are also not the best place to find cheap Alcatraz tickets since sellers usually jack up the price to take advantage of the fact that tickets for the Alcatraz tour are sold out. Rumor has it that SFPD runs sting operations to nab anyone selling Alcatraz tours last minute tickets on those sites. Luckily, there is a legal option of getting tickets through an official third party operator. You can still get sold out tickets to Alcatraz by buying them through a local tour company. While it is illegal to re-sell individual tickets to Alcatraz, there are official third party operators who are allowed to package tickets to Alcatraz with San Francisco tours. These third parties are not allowed to sell Alcatraz tours tickets by themselves — only as a part of a package tour. You’ll find some of the best Bay Area tours offer these Alcatraz combo tickets that include Alcatraz cruise tickets and a San Francisco tour. Now, we might be a little biased, but we’re a big fan of our A Day in the Bay Tour. That’s our ultimate one day San Francisco tour that includes Alcatraz prison tickets. A Day in the Bay Tour is one part San Francisco tour and one part Alcatraz tour. The best part? You have as long as you like to discover Alcatraz Island and do a self-guided tour of Alcatraz at your own pace! You must reserve these Alcatraz packaged tours at least four days in advance! As much as third party tour operators would LOVE to get you a seat on a last minute Alcatraz tour and San Francisco tour — Alcatraz won’t allow it. So, if you’re looking to buy Alcatraz tickets today, you’re out of luck. It’s not possible to get tickets to Alcatraz Island that last minute if Alcatraz is already sold out. All third party Alcatraz ticket sellers need to submit all guest names for these Alcatraz San Francisco tours to Alcatraz Cruises four days in advance. Double check — no, triple check — that these Alcatraz tour tickets actually go to Alcatraz Island! Some tour companies can be very misleading. Be sure that your Alcatraz tour actually goes to Alcatraz, and that your tickets for Alcatraz aren’t just a bay cruise that circles around the island. Ah, yes. San Francisco’s favorite past time — waiting in line. We’ll wait in line for everything, from the newest food truck to trains during rush hour. Waiting in line for tickets to Alcatraz is no exception. Now, we want to be totally transparent here. Waiting in the standby line for tickets to Alcatraz has absolutely no guarantee that you will actually end up with an Alcatraz ticket! But, this is the ultimate last resort since the standby line can begin forming as early as 4am, and the first ferry to Alcatraz doesn’t leave until after 9am. However, this is a viable option for one reason and one reason only: the ferry to Alcatraz waits for no one (especially when tickets are sold out). So, when someone misses their scheduled ferry, the Alcatraz Cruise will pull people from the standby line to take their place. Here’s the kicker, you need everyone in your group to get the tickets. Remember, re-selling tickets to Alcatraz is illegal — so this is how they can be sure you really are only getting as many tickets as you need to visit Alcatraz. If you just send one person in your group to buy Alcatraz tickets, only that person will be able to get a ticket! If you’re hoping to get tickets via the standby line — it needs to be a family affair. Since getting tickets to Alcatraz can be so difficult, take the easy route and reserve a seat on our San Francisco Alcatraz Tour! Once the summer months hit, this might be the only realistic way of “seeing” Alcatraz. Not visiting Alcatraz — just seeing it from a distance. While this isn’t the most satisfying way of experiencing Alcatraz Island because you don’t actually get to tour Alcatraz, it just might be the only way of getting close to the former San Francisco prison. Taking a bay cruise when tickets are sold out is a fun alternative because these cruises usually take you beneath the Golden Gate Bridge, and sometimes out to AT&T Park if the Giants are playing a game. This part of the Bay is usually filled with locals in row boats and fishing boats hoping to catch a fly ball out of the baseball park! As long as you are aware that these ‘Alcatraz Island tours’ don’t actually take you onto Alcatraz, then this will be a fun way of seeing the island when Alcatraz tickets are sold out. Or, if you want to experience a bit of local flavor you can head down to Fisherman’s Wharf, like where the actual fisherman are. Yes, we still have fishermen at the Wharf! As long as it’s not crabbing season, you can usually find local fishermen taking travelers out onto the water for trips to Alcatraz (but just around the island) — like Wacky Jacky on the Lovely Martha. Need more inspiration for your upcoming trip to Alcatraz? Don’t miss out on our related blog posts below!